Bion 3 Seniors 60 cp is a multivitamin complex intended for people who want to regain their shape and strengthen the natural defenses of their body, especially in case of fatigue, stress or overwork but also in case of sensitive noses, throats and exposed: cold, confinement , pollution, air conditioning ... Its formula contains Ginseng for immediate and lasting fitness. 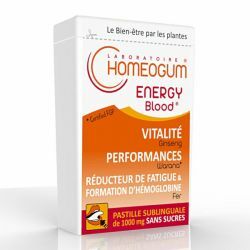 • 12 vitamins: A, B1, B2, B3, B5, B6, B8, B9, B12, C, D, E and 7 mineral salts: iodine, iron, zinc, selenium, chromium, manganese, mobyldene, in optimal dosage ( close to 100% of the Recommended Daily Allowances). However, today, some people do not reach the Recommended Daily Allowance (RDA) in certain micronutrients. • Ginseng extract, bilberry extract and lutein, which complement the formula. It is possible that the immune system weakens naturally with age. The positive effect of Bion3 Seniors' assets on the body's natural defenses during episodes of deformity such as winter manifestations has been scientifically proven. Its formula contains Ginseng for immediate and lasting fitness. 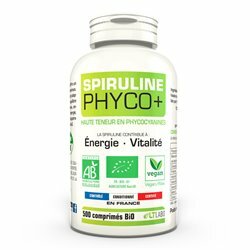 Stimulate the defense system of the body (the immune system) .Thus some probiotics can restore situations of imbalance prejudicial to health, prevent the appearance or repetition. 1 tablet per day to swallow with a glass of water for 30 to 60 days, repeat if necessary. 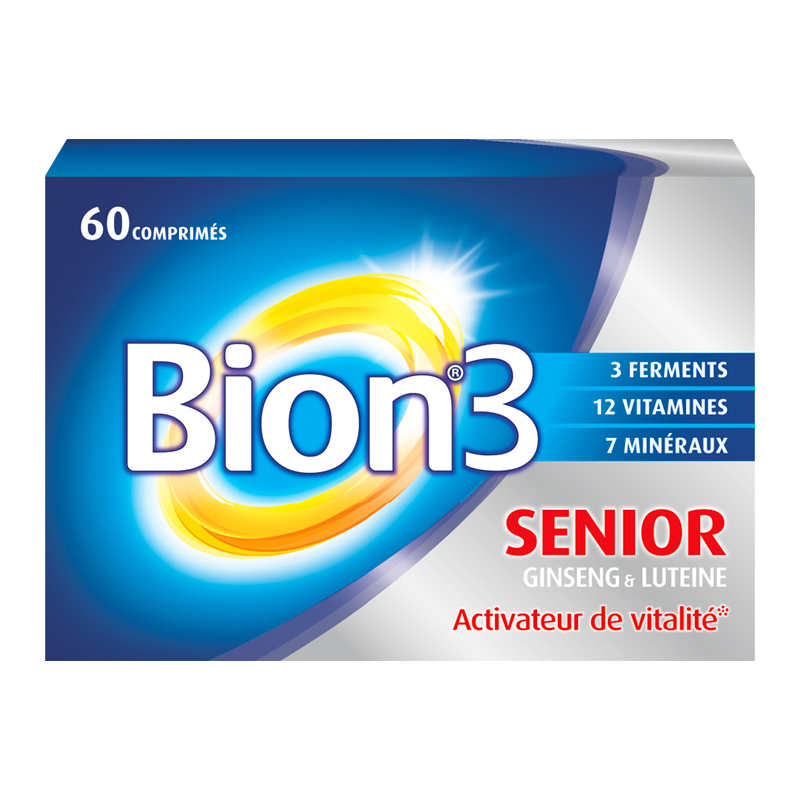 Bion®3 Seniors can be used in adults from 12 years old. Taking Bion®3 Seniors does not relieve a varied and balanced diet or a healthy lifestyle. Preparation of probiotic cultures Lactobacillus gasseri, Bifidobacterium bifidum, Bifidobacterium longum, Ca carbonate, dextrin and corn starch, Ca ascorbate or Vitamin C 60 mg, alpha tocopherol acetate concentrate or Vitamin E 10 mg, Ginseng extract 20 mg, Zn oxide is Zn 5 mg, nicotinamide 18 mg, Mg stearate, K chloride, Mg oxide Mg 45 mg, crospovidone, Ca pantothenate 6 mg, Ca phosphate, Mn sulfate monohydrate or Mn 1 , 2 mg, 800 mcg synthetic vitamin A concentrate, Na selenate at 30 mcg, pyridoxine hydrochloride 2 mg, cholecalciferol concentrate or vitamin D 5 mcg, thiamine nitrate or vitamin B1 1.4 mg, riboflavin 1.6 mg, cyanocobalamin 1 mcg, blueberry extract 1 mg, lutein 100 mcg, folic acid 200 mcg, K iodide i 100 mcg, biotin 150 mcg, Cr chloride or Cr 25 mcg, Na molybdate dihydrate or Mo 25 mcg, Fe oxide is Fe 5 mg, inulin, Mg stearate, F oxide e, colloidal silica, crospovidone, glucose, brilliant blue, croscarmellose sodium, colloidal silica, hydroxypropyl methylcellulose, povidone, microcrystalline cellulose, hydroxypropylcellulose, glycerol stearate, excipients for one tablet. • Do not cut the tablet. • Do not exceed the recommended daily dose. • Avoid taking Bion®3 Seniors in case of pregnancy. 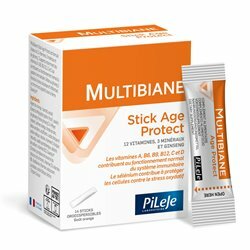 • Avoid the concomitant use of other products containing vitamins A and D.
• Avoid the use of Bion®3 Seniors in case of fructose intolerance, deficiency of saccharase-isomaltase or with glucose-galactose malabsorption. • Take into consideration the presence of potassium at the rate of 5 mg.
• DO NOT LEAVE THE REACH OF CHILDREN. • Do not use in case of intolerance to any of the ingredients. In rare cases, these products may cause allergic reactions. • Do not isolate yourself: invite, go out with friends and family. Bion 3 brings 3 strains of probiotics . Probiotics help to strengthen the barrier effect of the intestinal flora against pathogenic micro-organisms and to stimulate local and general immune functions. In addition , Bion 3 is a contribution of nutrients, vitamins and minerals important for the functioning of the body. 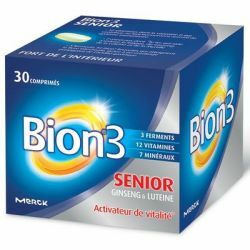 Bion 3 Seniors contains, in addition to ginseng, lutein and blueberry. Bion 3 Juniors is for children from 4 to 12 years old. Bion 3 probiotics were the subject of a double-blind, controlled clinical trial demonstrating their ability to strengthen natural defenses. Bion 3 is recommended in the following cases: in the case of compromised ENT sphere; in case of weakened natural defenses ; to better cope with the current rhythms of life: unbalanced diet, stress, overwork. Bion 3 is a range of dietary supplements that do not provide a varied and balanced diet or a healthy lifestyle. Contains milk proteins. Does not contain gluten. 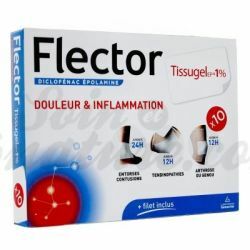 Available in pharmacy and drugstore online at the best price. The concept of probiotics comes from the work of Metchnikoff realized at the beginning of the 20th century. Probiotics are viable micro-organisms (bacteria or yeasts) that, when ingested in sufficient numbers, have a beneficial effect on health. They act as a balancing factor of the intestinal flora, the latter having a major role in immunity. Vitality Tonus: Boutique of organic herbal pharmaceutical products. Parapharmacy Phytotherapy, food supplements to keep the shape, tone and vitality. The body sometimes needs a little help to regain its vitality ! 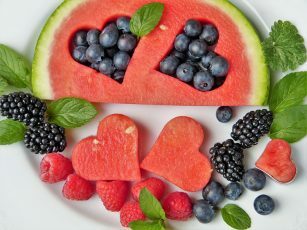 Tonus, physical and mental performances, sports activities: all these elements are synonymous with good health , and are for most people very much sought after. At changing seasons, it is not uncommon for the body to lose vitality and energy . Keep fit and naturally stimulate your vitality, with express boosters or background solutions . Discover our selection of the most effective anti-fatigue remedies .